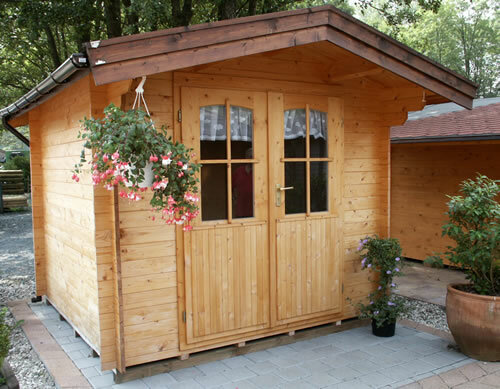 From our promotional range the Goteborg measures 2.5 x 2m (8'2 x 6'6) this building is made from 28mm logs and features a double, half glazed door to the front, ideal for use as a garden storage shed. It comes untreated but can be bought to life if painted. Outstanding in their quality due to their German engineering with precision and attention to details. This building is part of the promotional range of Bertsch buildings. Of course with every building being manufactured at point of order any combination or style is possible. Supplied with no roofing material. Shingles can be chosen below to enhance the shed. Additional windows and doors or partitions. 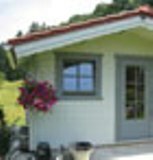 The wall and gable logs are chamfered to match the angle of the roof, other cabins finish on a tongue and it is not possible to get a full seal without applying trim to cover the inevitable gaps. Over time, especially when used as accommodation, office, studio etc this can cause great problems. Delivery is FREE to most locations in the UK however there may be additional charges for Scotland, Wales and parts of Cornwall. Please contact us for prices before ordering. Please note deliveries of these log cabins are on an articulated lorry which can be 40 foot long. Delivery is to kerb-side which means either to your front drive or front grass. The pallets will be off loaded and left in this location. Please advise us before placing your order if you foresee any access restrictions for this type of vehicle as there may be additional costs involved. A budget floor standing heater, ideal for use in average sized greenhouses. This fan will circulate air flow to help prevent fungal diseases. Designed to hang from the roof of your greenhouse.